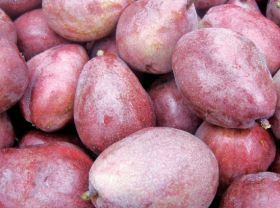 In the US, northwest pear growers have released their latest crop estimate for the 2018/19 season, with all signs pointing to a huge crop. Based on data reported from Washington's Wenatchee and Yakima districts and Oregon's Mid-Columbia and Medford districts, this year will be the fourth largest crop in history, according to Pear Bureau Northwest (PBNW). While the initial season estimate came in at 18.9m standard box equivalents, or approximately 415,000 tonnes of fresh pears, the current estimate is around 20.2m standard box equivalents, or 444,400 tonnes. "After last year's very small crop, our growers are pleased to have a full crop of great quality pears to meet growing consumer demand," stated Kevin Moffitt, president and CEO of PBNW. "Retailers have a strong opportunity for pear category growth in the produce department this season and we are prepared to provide them with individual category analysis, consumer insights, and effective promotions to drive pear sales." Picking has already begun throughout the four growing regions of the Northwest and will continue throughout August and September. Out of the leading varieties, the current estimates for this season are 9.9m standard boxes for Green Anjou (about 49.2 per cent of total Northwest fresh pear crop), 5.3m standard boxes of Bartlett (26 per cent of the total crop), and 3.2m Bosc (15.7 per cent of the total crop). Red Anjou will represent 5.1 per cent of the crop with about 1m standard boxes. The organic pear estimate is expected to come in at 2m standard boxes (44,000 tonnes), which would make up 10 per cent of the total Northwest crop. The PBNW international team will be focused on activities in top markets for the 2018/19 season - Mexico, Central America, India, Middle East and Asia - with in-store sampling, nutrition workshops, consumer advertising, movie promotional tie-ins, social media and event activations. To combat the increase in competition in many of the export markets, PBNW will initiate 1-2 month long promotion agreements with key retailers to increase shelf space, and improve space and location with USA Pears on ad in the stores.